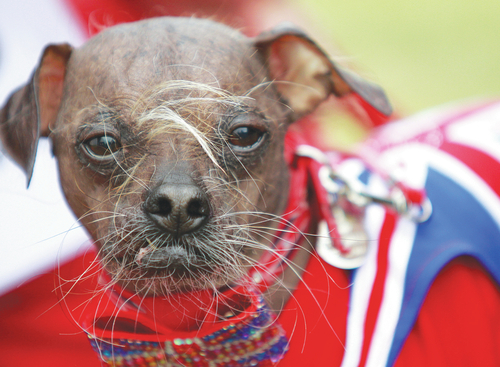 And…continuing with the topic of this year’s winners, let me introduce you to Mugly, a Chinese crested dog from the United Kingdom, who holds the 2012 World’s Ugliest Dog title. This peculiar contest that takes place every year in Petaluma, California, gathering the ugliest candidates of the dog population. It started in the seventies and, since 2009, it is part of the Sonoma-Marin Fair. The latter has collaborated with animal rights associations to promote the adoption of rescue dogs. Animal Planet broadcasts the show and sponsors the event, with its 24th edition taking place this year. To win the trophy, Mugly had to defeat 28 proud-to-be-ugly contenders from around the world. He also obtained the $1000 prize, as well as free dog cookies for a year, a VIP stay at the Sheraton Petaluma, a photo shoot and the opportunity to became a star by participating in different talk shows and events. Mugly, who is eight years old, is ready to show the world his atypical beauty through his website, where we can find pictures, videos and news, like the fact he is filming a documentary about his life. He has almost 3,000 friends on Facebook and more than 1,000 followers on twitter, proving that it is not all about exterior beauty.